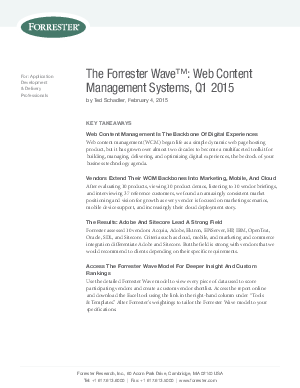 Web content management (WCM) software has become the technology and content delivery backbone of digital experiences. Firms that want to upgrade for mobile devices, consolidate potentially thousands of websites, or expand digital experiences to every customer touchpoint must choose a solid web content management product. Forrester has evaluated 10 vendors — Acquia, Adobe, Ektron, EPiServer, HP, IBM, OpenText, Oracle, SDL, and Sitecore — on 36 criteria for current offering, strategy, and market presence. We focus on baseline capabilities such as content and experience management, delivery, and optimization as well as on mobile support, cloud deployment, and integration with components such as marketing and commerce. Application development and delivery (AD&D) professionals can customize the requirements to re-rank the vendors according to their specific digital experience needs.